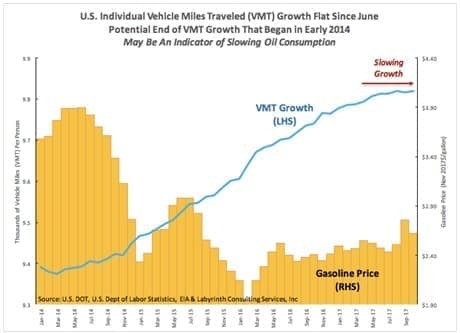 U.S. individual vehicle miles traveled (VMT) growth has been flat since June 2017, and the potential end of the VMT growth that started in early 2014 may be an indicator of slowing oil consumption, according to government data compiled by Labyrinth Consulting Services, Inc. Gasoline is the most consumed petroleum product in the U.S. Last year, motor gasoline consumption averaged about 9.3 million bpd, or 391 million gallons per day - the largest amount recorded and equal to about 47 percent of total U.S. petroleum consumption, data by the EIA shows. Some 29 percent of all U.S. energy consumption in 2016 was for transporting people and goods from one place to another, the EIA says. Petroleum products provided around 92 percent of the total energy the U.S. transportation sector used last year. The latest available data by the U.S. Department of Transportation shows that the seasonally adjusted vehicle miles traveled for October 2017 stood at 268 billion miles, a 0.8-percent increase over October 2016, and 0.2-percent growth as compared to September 2017. The cumulative estimate for this year is 2,685 billion vehicle miles of travel. In its latest Short-Term Energy Outlook (STEO), the EIA said that in November, U.S. regular gasoline retail prices averaged $2.56/gallon, an increase of nearly 6 cents/gal from the average in October, primarily reflecting rising crude oil prices. EIA forecasts the U.S. regular gasoline retail price will average $2.59/gal this month, 34 cents/gal higher than at the same time in 2016. For 2018, EIA expects U.S. regular gasoline retail prices to average $2.51/gal. Gasoline prices and increases in fuel efficiency are important factors in U.S. gasoline sales that are also highly seasonal, but according to Jill Mislinski at Advisor Perspectives, there are also some significant demographic and cultural dynamics affecting the U.S. gasoline consumption trends. In a post from November 2017, Advisor Perspectives said that apart from fuel efficiency improvements, declines in gasoline consumption can be attributable in large part to factors such as an aging population leaving the workforce; growing trend toward working from home; social media providing alternatives to face-to-face interaction requiring transportation; a general trend in young adults to drive less; and accelerating urban population growth, which reduces the per-capita dependence on gasoline.